Britain faces a moment of truth Tuesday when parliament votes on Prime Minister Theresa May’s ill-loved Brexit plan — a day after she said she secured last-minute changes to the deal from the EU. May huddled late Monday with EU leaders in Strasbourg in a bid to salvage the vision of Brexit she set out after coming to power nearly three years ago. The two sides then announced “legally binding changes” to the old agreement aimed at addressing Britain’s needs and getting the deal through parliament. “Now is the time to come together, to back this improved Brexit deal, and to deliver on the instruction of the British people,” May said. But late Monday, Britain’s main opposition Labor Party announced it would vote against the deal, saying May had “failed”. “This evening’s agreement with the European Commission does not contain anything approaching the changes Theresa May promised parliament,” said Labor leader Jeremy Corbyn. Political chaos verging on panic has gripped Britain as its 46-year relationship with the European Union nears its scheduled end in 17 days. The UK still has no roadmap for leaving and is increasingly doubting if the divorce it set in motion in a 2016 referendum will ever even take place. The main trouble started when May’s deal with the remaining 27 EU nations — pieced together over tortured months of negotiations — suffered an historic defeat in the House of Commons in January. May has been delaying a second showdown in the hope of wresting concessions from Brussels that could appease lawmakers and save her teetering government, which she claimed to have achieved in Strasbourg. “It’s this deal or Brexit might not happen at all,” European Commission chief Jean-Claude Juncker said after their meeting. Brexit hardliners from May’s Conservative Party and the DUP, a small Northern Irish party which is part of May’s coalition government, have said they will scrutinise the documents that have been agreed. The vote is expected at around 1900 GMT. Another defeat would set the stage for additional votes in parliament this week that could postpone Brexit and possibly reverse it in the months to come. Any delay may have to be short-lived. 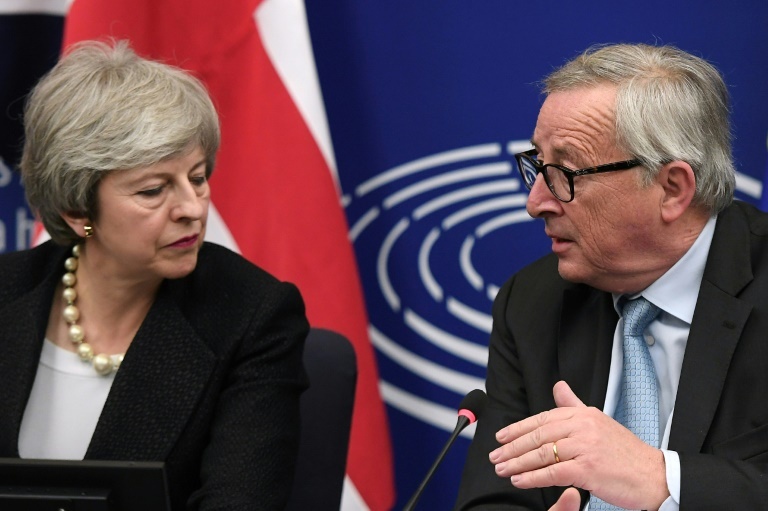 Juncker on Monday said a delay beyond European Parliament elections at the end of May would mean Britain would have to take part in the polls. The issues tearing apart politicians are the same ones Britons have been arguing over throughout their uneasy stay in the European project. About half the voters think the former global empire can restore its past glory by striking its own trade deals and limiting numbers of EU migrants. The other half views themselves as inherently European. They also remain open to immigration and warn of dire consequences from cutting ties with Britain’s biggest trade partner. The divisions in parliament follow the same patterns and are also reflected by rival camps in May’s endlessly bickering cabinet. The actual issue holding up the agreement concerns the technical conundrum of how to keep the Irish border free-flowing once a UK-EU frontier splits it from Britain’s Northern Ireland after Brexit. The temporary “backstop” solution found in the current deal would keep Britain closely aligned to EU trade rules and Northern Ireland even more so until the sides reach a new trade deal or come up with a better fix. But those who back Brexit fear getting trapped in this quasi-union with Europe indefinitely. EU leaders see the arrangement as essential for guaranteeing the bloc’s sovereignty and preserving the peace deal in Northern Ireland. May has sought to thread the needle by securing a guarantee from Brussels that the Irish solution will not keep Britain permanently tied to the bloc. A government defeat on Tuesday could see parliament try to take control over what happens next. May has promised to give lawmakers a vote on Wednesday on whether Britain should simply leave without any deal at all. The option is fraught with economic dangers and is backed only by the most hardened proponents of the divorce. If MPs would defeat the “no-deal” scenario, it would be followed on Thursday with a vote on requesting a delay from the EU. The other 27 nations would need to unanimously back the extension and decide how long it should be. Two forces are expected to then spring into action: groups backing a much closer EU-UK union — and ones that simply want the whole thing reversed in a second referendum.